When Dian was six she narrowly escaped a tsunami of boiling mud that completely submerged 16 villages under a moonscape of grit, leaving 60,000 people displaced. Lapindo, an Indonesian drilling company, had unleashed a violent, unstoppable flow from the earth's depths, estimated to continue for another decade. Shot over six years, GRIT witnesses Dian's transformation in to a politically active teen, as she and her mother take on the perpetrators. When Dian was six years old, she heard a deep rumble and turned to see a tsunami of mud barreling towards her village. She remembers her mother scooping her up to save her from the boiling mud. Her neighbors ran for their lives. Sixteen villages, including Dian’s, were wiped away. The majority of international scientists believe that Lapindo, a multinational company that was drilling for natural gas in 2006, accidentally struck an underground mud volcano and unleashed a violent flow of hot sludge from the earth's depths. Ten years later, despite initial assurances to do so, Lapindo has not provided 80% of its promised reparations to the hundreds of victims of who lost everything in the mud explosion. While the survivors live in the shadow of the mudflow and wait for restitution, they live in makeshift rented homes next to levees that hold back the compounding mud. With old job sites buried deep, the victims have turned the disaster site into a popular tourist destination. Dian’s mother, for example, who was widowed within a year of the explosion, has reinvented herself as an unofficial mudflow tour guide in order to make ends meet. She spends her days guiding curious Indonesians across the wasteland so the tourists can snap photos of the boiling muck and thick steam that continue to spurt violently into the sky. The vast lunar landscape is littered with bizarre activities: fashion photographers take stylish photos of models posing in ball gowns; vendors sell selfie sticks, DVDs and meatballs; protesters smear mud over their bodies in stubborn acts of resistance. Yet Dian is determined to rise out of the muddy life. Together with her mother and many of their neighbours, they fight the commercial powers accused of this colossal environmental disaster. Grit bears witness to Dian’s transformation into a politically active teenager as she questions the role of corporate power and money in the institution of democracy itself. For a Q&A with directors Cynthia Wade and Sasha Friedlander, see here. Cynthia’s 2008 documentary Freeheld won a 2008 Academy Award for Best Documentary Short Subject, Special Jury Prize at the Sundance Film Festival and 13 other awards. She was a lead producer on the 2015 fictionalised adaptation of Freeheld, starring Julianne Moore and Ellen Page. She is the director of the Grist for the Mill (1999), Shelter Dogs (2004) and Generation Startup (2016), and producer of The Gnomist (2015). Wade has won more than 45 film awards worldwide. Sasha directed, produced, shot and edited the feature-documentary Where Heaven Meets Hell. The film won numerous prizes including Best Feature Doc at the LA Asian Pacific Film Fest, Hawaii IFF and Special Mention for Outstanding Cinematography at the LAAPFF. The Alliance of Women Film Journalists awarded Sasha an EDA Award for Documentary Artistry in March 2013. Sasha is fluent in Indonesian and worked there as a journalist for several years. 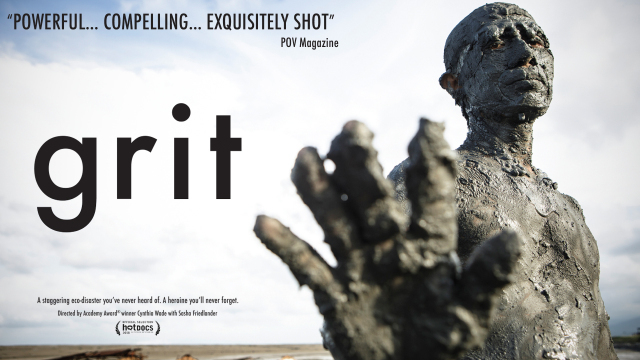 Shot and directed over the course of six years, Grit was met with critical acclaim at its World Premiere (“Shot with poetic grandeur and packed with stirring political heft” - POV Magazine). The film features never-before-seen footage from the inside of the disaster’s conflicts, and rare interview with the former CEO of the drilling company. Our hope is that audiences will leave the theater with a better understanding of the world’s largest Muslim country. We want people to think about the urgency for political engagement, the importance of women in leadership roles, and the power of art and perseverance in social and environmental struggles. It’s hopeful that we’re seeing young people stepping up and demanding change worldwide. After watching this story unfold, we hope audiences are inspired to cultivate their own determination, and their own grit.